LaserMed Skin and Vein Clinic in Alpharetta offers RF Needling, the latest in radio frequency procedures for alleviating wrinkles and fine lines, while tightening the skin. For those wanting to look their best at any age, you now can with the Vivace Fractional RF Needling procedure. 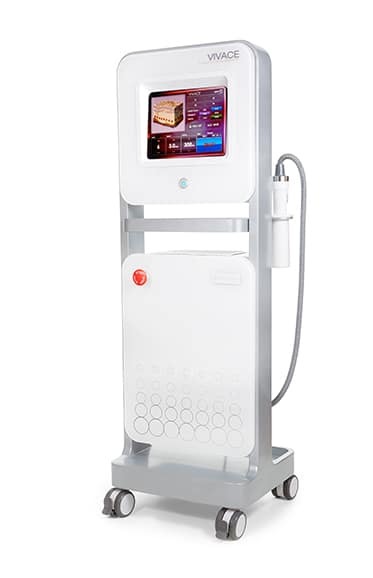 It’s simple, non-invasive, and will address those fine lines and wrinkles with no down time. 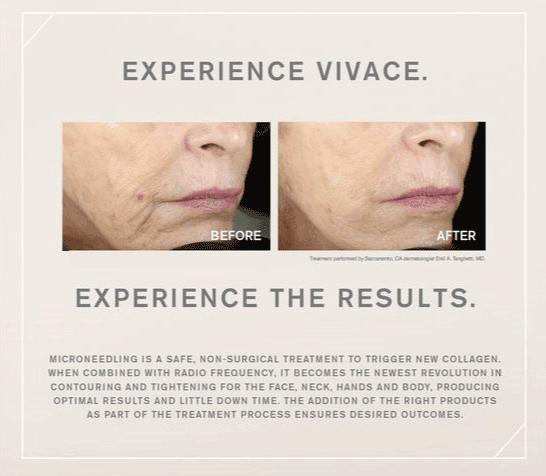 Is Vivace Fractional Micro Needle RF Right for You? We start with the most revolutionary, best-in-class Vivace Microneedling RF device, designed for an incomparable, comfortable patient experience. Only The Vivace boasts a precision robotic motor that brings discomfort to a virtual zero compared to any other device you will find anywhere. Dr. Chapman personally recommends that this is the best treatment on the market today. The carefully developed recovery system ensures no one knows you just had a treatment today. The results are immediate and also improve over time, giving you the best of both worlds. Dr. Chapman still suggests using Ultherapy for DEEP tightening and lifting, but superficial to intermediate tightening will be done concurrently with Vivace, with minimal pain. With a numbed face, the treatment feels like little more than light pressure to the face, with an occasional, light sparking feeling. The Personalized Compounded Numbing Cream, the best numbing cream available, is applied 30 to 45 minutes prior to the treatment to ensure a comfortable patient experience throughout the treatment. Many testimonials from patients say they found the treatment to be in a range of comfortable to virtually pain-free. The Vivace was designed with patient comfort in mind. The actual treatment takes about 45 minutes, with additional 30 to 45 minutes needed for numbing. Dr. Chapman as well as her two aestheticans, Edyta and Dawn, will perform the Vivace treatment. Everyone is different, but the collagen and elastin you make is your own. It continues accelerated production over the next six months as results improve over time. For maximum results, Dr. Chapman recommends three Fractional Micro Needle RF treatments scheduled four to six weeks apart. Dr. Jean Chapman thinks the Vivace Fractional Micro Needle RF procedure is truly amazing and has seen great results for her patients who have tried the procedure. If you are ready to really keep up on a regular maintenance program with your face, skin and body being toned, and tightened naturally without downtime take a look at our 2 membership plans. The Elite and Ultimate packages can save you money while offering all the treatments and products you need to have an on-going youthful appearance! Ready to schedule? Call 678-990-4900.